Suburbs of Columbia: Ironville, Kinderhook. Columbia is also known as: Lancaster County / Columbia borough. Zip codes in the city: 17512. Some of the notable people born here have been: Dean Young (poet and author), and Suzanne Westenhoefer (actor and stand-up comedian). 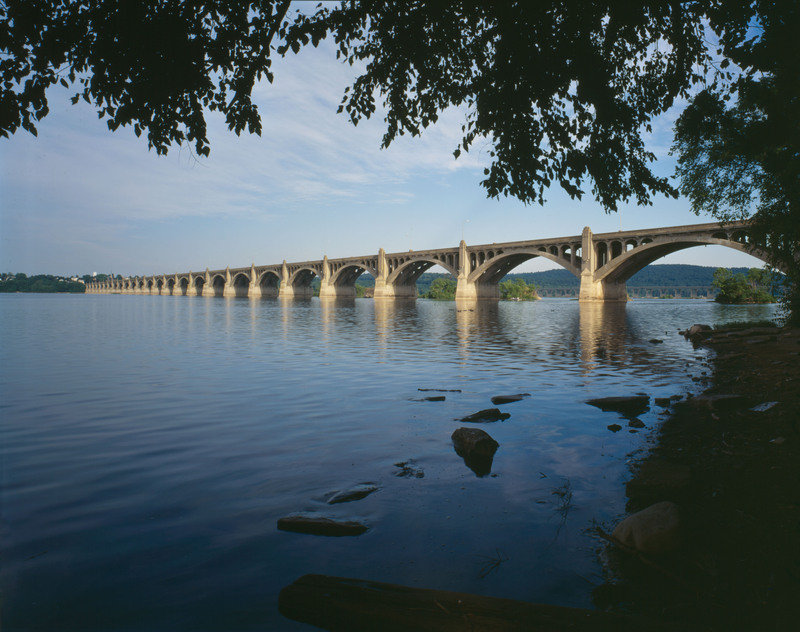 Columbia, formerly Wright's Ferry, is a borough in Lancaster County, Pennsylvania, 28 miles (45 km) southeast of Harrisburg on the left (east) bank of the Susquehanna River, across from Wrightsville and York County and just south of U.S. Route 30. The settlement was founded in 1726 by Colonial English Quakers from Chester County led by entrepreneur and evangelist John Wright. Establishment of the eponymous Wright's Ferry, the first commercial Susquehanna crossing in the region, inflamed territorial conflict with neighboring Maryland but brought growth and prosperity to the small town, which was briefly considered as a candidate for the new United States' capital. Though besieged for a short while by Civil War destruction, Columbia remained a lively center of transport and industry throughout the 19th century, once serving as a terminus of the Pennsylvania Canal. Later, however, the Great Depression and 20th-century changes in economy and technology sent the borough into decline. It is notable today as the site of one of the world's few museums devoted entirely to horology. It was revealed on June 24th, 2018 that Ernest W Daniels passed away in Columbia, Pennsylvania. Daniels was 86 years old and was born in Des Moines, IA. Send flowers to share your condolences and honor Ernest W's life. It was noted by Orlando Sentinel on January 22nd, 2017 that John Edward Stauffer passed on in Kissimmee, Florida. Stauffer was 90 years old and was born in Columbia, PA. Send flowers to express your sorrow and honor John Edward's life. It was noted on January 21st, 2017 that Tammy "Meatball" Chaphe (Peters) perished in Marion, Virginia. Ms. Chaphe was 44 years old and was born in Columbia, PA. Send flowers to express your sorrow and honor Tammy "Meatball"'s life. It was noted by Johnstown Tribune-Democrat on October 2nd, 2015 that Helen "Sister M Emmanuel" Palus passed on in Columbia, Pennsylvania. Palus was 90 years old. Send flowers to express your sorrow and honor Helen "Sister M Emmanuel"'s life. It was disclosed by Johnstown Tribune-Democrat on May 12th, 2014 that Mary G Decarlton (Werfel) died in Columbia, Pennsylvania. Ms. Decarlton was 87 years old. Send flowers to express your sympathy and honor Mary G's life. It was disclosed by Canon City Daily Record on February 3rd, 2014 that Robert Lee "Bobby Lee" Englehart perished in Colorado Springs, Colorado. Englehart was 74 years old and was born in Columbia, PA. Send flowers to express your sorrow and honor Robert Lee "Bobby Lee"'s life. It was noted by Juniata Sentinel on November 27th, 2013 that Elvin B Lockard perished in Columbia, Pennsylvania. Lockard was 96 years old. Send flowers to express your sympathy and honor Elvin B's life. It was noted by Tampa Tribune on October 27th, 2013 that Elna S "Ellie" Storti (Staman) perished in Lake Placid, Florida. Ms. Storti was 89 years old and was born in Columbia, PA. Send flowers to express your sympathy and honor Elna S "Ellie"'s life. It was disclosed by Johnstown Tribune-Democrat on September 21st, 2013 that Ethel M Reckner (Kurtz) perished in Columbia, Pennsylvania. Ms. Reckner was 91 years old. Send flowers to express your sorrow and honor Ethel M's life. It was written by Lancaster Intelligencer Journal on August 15th, 2013 that Dorothy L Rutter (Deeg) passed away in Columbia, Pennsylvania. Ms. Rutter was 78 years old. Send flowers to express your sorrow and honor Dorothy L's life. Smith’s Algonquin interpreter first used the term, which means “People at the Falls” or “People of the Muddy River.” The Susquehannocks established villages just south of Columbia in what is now known as Washington Boro, as well as points as far south as modern day Maryland. Columbia is a borough in Lancaster County, Pennsylvania County, Pennsylvania, 28 miles (45 km) southeast of Harrisburg, Pennsylvania on the Susquehanna River across from Wrightsville, Pennsylvania Originally, the place was called "Wright's Ferry." It was founded in 1726 by English Religious Society of Friends from Chester County, Pennsylvania County. The Susquehannocks had migrated to the area around 1575 to 1600, after separating from the Iroquois, a federation including the Mohawk, Oneida, Cayuga, Seneca, and Onondaga tribes. Population counts were these: in 1890, 10,199; in 1900, 12,316; in 1910, 11,454; in 1920, 10,836; and in 1940, 11,547. Smith estimated their numbers to be about 2,000 at the time. The official website for the city of Columbia is http://www.columbiapa.net. Fulton was born in Ridley Park, Pa., and called sports in New Jersey, Arkansas and Colorado before landing in Columbia in 1952 to broadcast minor ... grandchildren. Funeral arrangements have not been completed. His funeral was held Saturday at St. John ... of Hebron, Conn., and Columbia, respectively; daughters Laura Ciarrocchi of Ellicott City, Kathryn Wenner of York, Pa., and Jennifer Daly of Reisterstown ; and six granddaughters. Listing all funeral homes in Columbia, Pennsylvania so you can easily send flowers to any location (same day delivery) or find any funeral service.